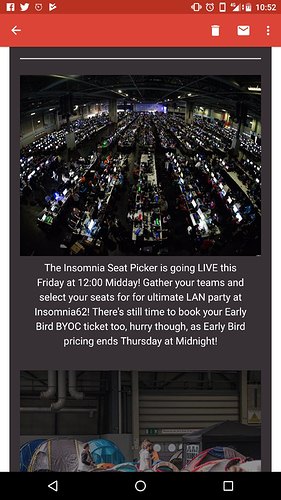 Anyone know when the tournament announcements are for this lan? What are you hoping to be there? Most likely once all the tickets have sold a week before LAN. Just expect the usual stuff of League, Dota, CSGO and Hearthstone. I am happy to play CS in a mix, not wanting to prac though. wait, what? are you okay? @Nodawe who from fedex? Nord? You, Hyams and @smather, what more could you want? Just three man the tourny. If I ain’t in a league team this LAN I wouldn’t mind doing a cs mix, never done one before at lan surprisingly. well well could be a ting then! Might just drop in for the day/night see some old faces! Are you all going for the whole thing? Would there be a better night to come share a few bevvies? Not sure I’m there for the whole thing, but me and Rodney usually go for the Saturday. It’s always the best night for drinking. so i emplore you to cop tickets ASAP so I can get us seated. The ticket has been purchased. The hotel booked. I shall be in attendance for the whole event.